Our unfiltered cosmetic grade beeswax is 100% pure, raw beeswax taken straight from the hive without any additional filtering or processing. We think that beeswax is one of nature's most amazing products! It is derived from the nectar that honey bees go out and collect from flowers which is also where honey is derived from. Honey bees have four pairs of glands on the underside of the abdomen that secretes this beautiful product. Beeswax has a wide variety of uses including candles, an ingredient in body care products, sewing and embroidery to make it easier to run a needle through fabric, as a shoe polish ingredient and even an ingredient in surf and ski board wax. Because 100% pure beeswax is a completely natural product, the color and aroma will vary from batch to batch. This variability depends on where the nectar was collected and from the type of plant as well as where the wax came from within the hive. It could come from either the honeycomb cappings or from the foundation used in the hive. In general, beeswax from honeycomb cappings is lighter in color and has a more sweet, honey-like aroma than beeswax taken from foundation. 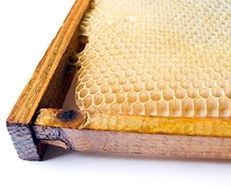 Our unfiltered cosmetic grade beeswax is specifically more of the type of wax from honeycomb cappings although it could also be a combination of both cappings and foundation wax. Please be aware that since it is unfiltered, it most likely will contain impurities such as bee parts, bee pollen or wood chips that need to be filtered out (see below for how to filter). We are proud to say that we source all of our pure, domestic beeswax from the Pacific Northwest (Oregon, Idaho, Washington and Western Montana). We have long established relationships with Pacific Northwest beekeepers who we purchase this beeswax from. Our unfiltered cosmetic grade beeswax is a premium wax that works beautifully for making candles and body care products. Its light golden color and sweet, honey aroma make delightful candles of all types including tea lights, votives, pillars and tapers. Beeswax used completely on its own in candle making has a set of unique characteristics including being nearly dripless and smokeless. Since beeswax has a melting point of approximately 145 degrees F, it is a much harder wax compared to other candle waxes which means it will burn longer. This beeswax is also the wax of choice to use in making body care products. It's light color and delicate aroma make it so that the wax does not overpower the other ingredients in your body care products. It is used in lip balm, creams, salves, deodorant sticks and lotion bars. If you are looking for a specific recipe to use our unfiltered, cosmetic grade beeswax in, be sure to check out our craft projects and recipes blog. We recommend to filter this wax before use as it contains impurities foreign materials. To filter, simply melt on the stovetop in a double boiler. Once melted pour through nylon or cheesecloth into a clean, dry container. The nylon or cheesecloth should catch most of the impurities both large and small. If some remain, repeat this filtering process. Our unfiltered cosmetic grade beeswax is less expensive than our filtered cosmetic grade beeswax so if you want to save a little money and don't mind the extra time it takes to filter the wax, this would be a great choice for you! If you are using our unfiltered cosmetic grade beeswax to make candles, it is important to not that 100% pure beeswax shrinks very little upon cooling. Given this, the liquid volume is close or equal to its dry weight. Since it doesn't shrink much and if using to make candles, extra care is needed to prevent sticking in candle molds. To prevent sticking, we suggest to spray candle molds with olive oil or silicone spray before pouring hot beeswax into the mold. Another useful tip for getting beeswax candles to release from molds is to place the wax-filled mold in the refrigerator or freezer for the last 30 minutes of cooling.